St. Joseph Parish officially began in 1845. Before that priests traveling through the area offered Mass to the Irish immigrants, who were building the Pennsylvania Canal. Once a priest was officially assigned to St. Joseph Church in Milton, that priest came to visit Danville on a regular basis. The first church was built on the corner of Pine and Center Street (now a warehouse). 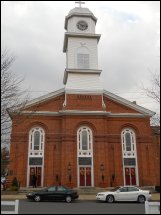 Our current church was started in 1867 and dedicated in July of 1869. We were part of the Diocese of Philadelphia until the Diocese of Harrisburg was formed in March 1868. The bell in the steeple was hung in 1880. The four-sided clock was installed in 1881. Our pipe organ was installed in 1874. The first Catholic School was located in the original church building, and it opened in September 1890. By April of 1893, the school and convent were located on the corner of Ferry and Bloom Street. That building was enlarged in 1896. Our current school building was dedicated in 1961. The St. Hubert’s Building, which contains the parish offices, the daily Mass Chapel, parish library and restrooms was completed in 1989. It was named St. Hubert’s to commemorate the German parish of St. Hubert, which had been become under the pastor of St. Joseph in 1945 and was absorbed by St. Joseph Parish in 1959. St. Hubert’s Church was located on corner of Bloom and C Street. There also was a St. James Church out in Exchange, which was closed sometime in late 1940’s. It is remembered by a window in the chapel as well as the annex to the school is called St. James.